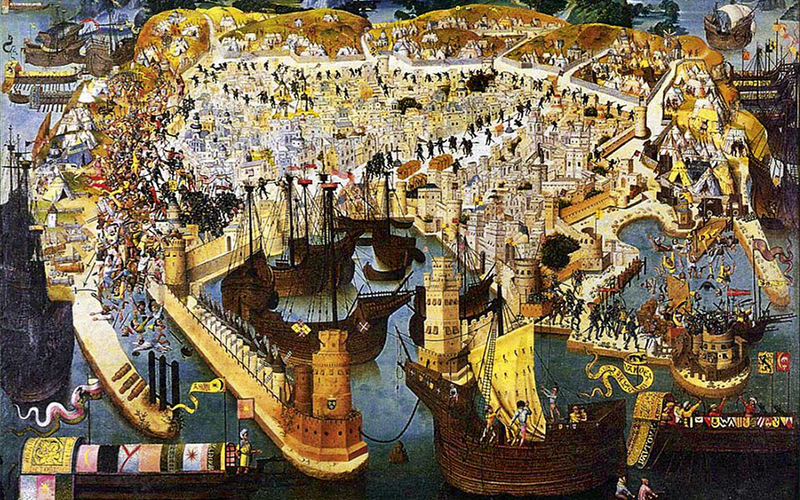 The Siege of Rhodes by the Ottomans, 1480. Oil on wood, from the Municipal Museum of Épernay, France. Under the rule of the Knights of the Order of St John, Rhodes became Christianity’s most defiant outpost in the East. For over two centuries, between 1309 and 1522, the island of Rhodes was a sovereign state under the rule of the Knights of the Order of St John. It minted its own currency and boasted a commercial port to rival Venice, acting as a gateway between Europe and the Holy Land. The medieval city of Rhodes, contained within the fortifications built during the Crusaders’ rule, is today the largest active medieval town in Europe and is protected as a UNESCO World Heritage Site. The Order of St John (or, the Order of Knights of the Hospital of Saint John of Jerusalem, to give its full name) was founded during the First Crusade as a monastic order with a medical mission. Its monks ran a hospital for Christian pilgrims in Jerusalem, and were hence known as the Hospitallers. Under the threat of Muslim invasion, the brotherhood became increasingly militarised and began to provide armed escorts for pilgrimages. Its members swapped their monks’ habits for armor and eventually became a multinational elite fighting force answering only to the Pope. When Jerusalem fell to the Arabs in 1291, the Hospitallers moved first to Cyprus and then found a new base on Rhodes. According to one account, they besieged the island for three years before it surrendered; in another version of events, they purchased it (along with neighbouring Kos and Leros) from the Genoese, who had tired of defending the islands from pirate raids. The Knights of St John established their new headquarters on Rhodes in 1309. Under the Knights of St John, Rhodes became a bastion of the Christian West right on the border with the Muslim world, and a defensive outpost against the raids of the Barbary pirates. 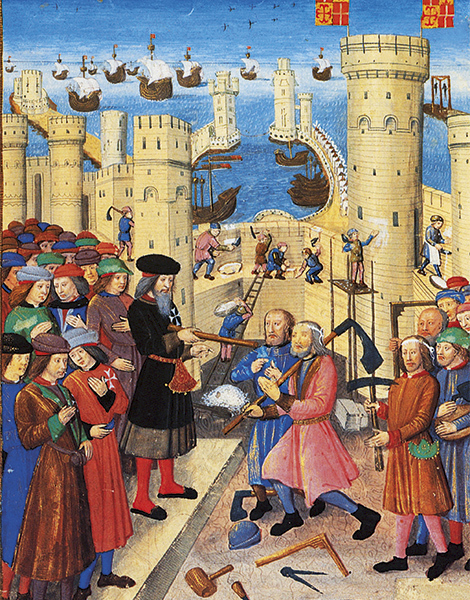 During the Crusades, the Knights prospered and invested their wealth in fortifying Rhodes. They brought the most skilled craftsmen and master builders to transform the existing Byzantine citadel into what is today one of the finest surviving examples of Gothic defensive architecture. The surviving walls run almost 4k in encircling the Old Town. They are 12m thick each and sometimes they are either doubled or tripled. What’s more they are all surrounded by a moat. 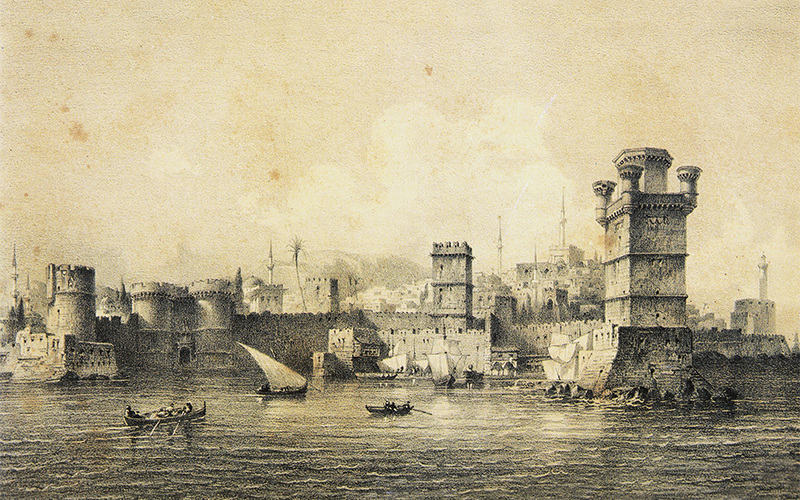 The fortifications of the harbor of Rhodes as seen in a 1862 engraving. In the foreground stands the imposing Naillac Tower, built during the rule of Grand Master Philibert de Naillac (1396-1421). Over the years, the walls were continually rebuilt and upgraded to cope with new military technologies, including the introduction of the cannon in the mid-15th century. A network of secret tunnels linked the city to the surrounding countryside, allowing supplies to be brought in during a siege. Outside the citadel of Rhodes Town, the island’s 50 villages were guarded by 11 castles, making up a formidable defensive network. The mouth of the harbor, which became one of the busiest in the Mediterranean, was protected by a submerged chain, which could render it impassable to enemy ships. Arriving by ferry today, you get an idea of the sense of awe that the fortified city would have inspired in its would-be attackers. The Knights were organized into eight “Langues” (tongues), each named after the part of Europe where its members hailed from, including France, Germany, England, Spain and Italy. Their commander was known as the Grand Master. Each Langue was responsible for guarding a section of the defensive walls. 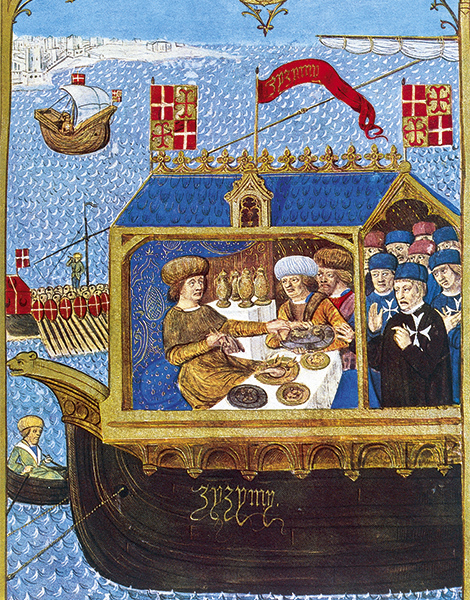 The Knights attracted to Rhodes not only their own extensive retinue, but also many wealthy merchants who were able to use the safe port to trade across the Mediterranean. The official written languages of Rhodes under the Crusaders were French, Latin and Italian, but the language spoken by the new inhabitants on the narrow cobbled streets was probably a kind of “Esperanto” of the time, mixing Italian, Spanish and French. The walled town was divided into three sectors: the administrative quarter, which was centered around the Palace of the Grand Master, at the highest point of the city; the Kollakio, which was inhabited by the Knights; and the Bourgo (lower town, or Chora in Greek), where the rest of the population lived, including the Greek and Jewish communities and the secular Franks. The protection offered by the walled city was formidable. In 1480, the citadel of Rhodes was able to withstand a two-month siege by a Turkish army of 70,000, despite being defended by a much smaller force of 600 knights and 2,000 soldiers. The Turks returned with a much larger force in the summer of 1522. Over a grueling six months, the knights inflicted on their besiegers an astounding 73 deaths for every one that they suffered, but eventually they were forced to surrender and leave the island for good, along with a large part of the Greek population. When the legendary conqueror Suleiman the Magnificent rode into town after days of sacking, it is said that his horse waded ankle-deep in the blood running down the cobbled streets. The violence was such that the Sultan ordered his army to stand down at once. This marked the end of an era. Several notable monuments were added during the subsequent Ottoman occupation, and large parts of the medieval city were destroyed in an explosion in 1856. However, the buildings erected by the Knights still dominate the city, either in their original form or as lovingly restored by the Italian administration of the early 20th century, which stripped them of all anachronistic additions. The Old Town preserves the medieval street layout and is mostly pedestrianized, allowing visitors to explore at their leisure a living monument.